DreamHost is an award winning and perhaps one of the oldest web hosting companies out there, so they have mastered the art of providing top quality web hosting with plenty of perks, features and plans. Not many hosts offer a 100% uptime guarantee, but DreamHost do. This means they have a lot of pressure on their shoulders to provide that consistently to their users. The service provides shared hosting, VPS and dedicated plans that come with a 14 day free trial so you can explore what DreamHost have to offer before jumping straight in. Once you have accustomed yourself to the hosting dashboard you will find that there are plenty of unlimited features, and tools but they do lack a telephone number..
A 97 day money back guarantee will also provide you with a confidence boost in case you find that the service isn’t to your expectations. Want to know if DeamHost is right for you? Many web hosts provide you with unlimited features, and DreamHost is not an exception – you’ll get no limits for bandwidth, disc space, mail accounts, domains hosted, MySQL 5 databases and several other options. It already sounds great, though it’s only the beginning. Other interesting technical features of DreamHost plan include free domain registration, multiple coding languages support (PHP5, Perl, Python, etc), daily access statistics, one-click installs for various plugins, platforms and other ready solutions, etc. Also, you’ll get a $100 bonus credit for starting the promo campaign with Google AdWords. Perhaps our biggest talking point here is the fact that DreamHost offer a full 100% Uptime guarantee. This guarantee beats most, if not all web hosting companies to date, but they do have a lot of responsibility lying on their shoulders. That’s why DreamHost have the best in monitoring equipment and server security, something that clearly had to be addressed in a 2012 hack attempt on the servers. If the service falls under 100% then you will be rewarded with a day of free services for each hour the Uptime falls under 100%. Add to that the fact that you will benefit from a 50GB auto-backup, which again beats most web hosting companies, and you will see that you are in good hands. The majority of DreamHost users report of a smooth and intuitive user experience, with easy navigation menus, accessible help buttons and clear instructions. Technical support at DreamHost is superb for a DIY lovers, but not for novices. They get points for an extensive Wiki and Discussion Forum as well as very active blog and Twitter feed. What they don’t offer you is phone or live chat, and this is a disadvantage in no uncertain terms. It can be frustrating, when nothing is running smoothly. However, they promise to respond to your emails within 24 hours and many users are happy with DreamHost support. Phone Support – Limited number of “call backs” for certain plans. Many hosting companies have one price plan for new accounts and another for renewals. 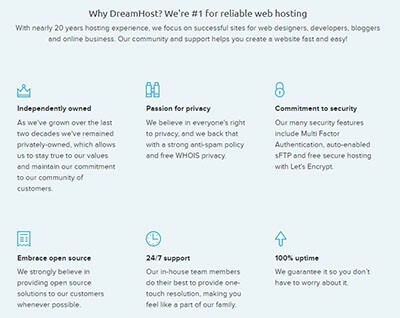 DreamHost is no exception, but has discounts for contracts as long as 10 years. Their Shared plan does not offer an eCommerce solution – you have to use its CafeCommerce for $30 a month. If your site does grow, they offer VPS and Dedicated Server plans so you won’t have to move. Monthly prices may seem a bit high compared to other competitors, however the amount of good features provided by DreamHost is certainly worth the game. Moreover, you can take a free trial for two weeks. Just remember that if you cancel after the 97 days free trial period, you’ll still have to pay for the “free” domain. 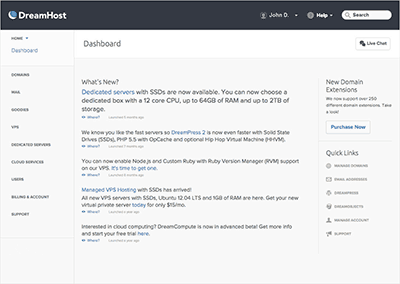 DreamHost VPS hosting offers are all powered by Debian Linux, and look extremely exciting. What is special, you will get unlimited bandwidth and disk space even with the cheapest package. In total, you can choose from 5 plans with 300-4000MB RAM and monthly fee ranging between $15-200/month. VPS by DreamHost is a great solution for projects expecting rapid growth, as zero limit for bandwidth and storage is very good in terms of flexibility. DreamHost used to offer 6 Dedicated hosting packages, but recently, they have changed their pricing model and are now offering only one option, which starts at 169$ per month and may go up. The plan includes unlimited bandwidth Another great thing you will like is the RAID technology protecting your data really well; which is included in the more advanced packages. You should also note that there’s no CPU data, so this basic feature remains somewhat vague, and you’ll have to make additional research before purchasing a dedicated server from DreamHost. If you are looking for a reliable host with a strong web presence, DreamHost is a viable option. They are not out to fool or confuse you into buying more than you need. If you are not a people person, you won’t mind not having anyone to phone or chat in case you ordered their Shared plan. Like DreamHost Review? Visit DreamHost. Wondering how DreamHost stacks up against other Web Hosting companies? Enter any other Web Hosting company and we will give you a side-by-side comparison.